Domestic Airline, Passion Air has made an inaugural flight to Takoradi as it readies to commence scheduled flights to the region. The new route brings to three the total destinations frequented by the airline since it commenced operations in August this year. 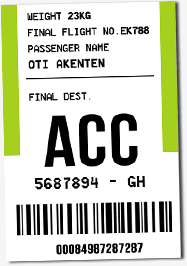 The airline already does Accra-Tamale-Accra and Accra-Kumasi-Accra. The Accra-Takoradi route will be commencing on Monday, December 10. According to the Commercial Manager for Passion Air, Anita Khouryfor, the strategic decision to commence services to the region was in response to a growing demand by passengers. Speaking at the inaugural flight ceremony at the Takoradi airport, the Deputy Minister for Aviation, Kwabena Otchere Darko-Mensah said the move will give a boost to the economic activities in the area. He said, “As we know Takoradi is the oil city and there is a lot of mining activity here as well, so we are glad we can provide businessmen with the safest means of transport from every part of the world to this place”. The Minister further indicated that the government was seriously considering the construction of a new airport in the Takoradi to further support airlines and air travel.